I stumbled across a friends profile on Twitter the other day. I hadn’t seen her for 10 years so was interested to see what she was up to. I wasn’t surprised that she was married I was surprised that she wore it as a status symbol. There is so much more to live for than whether or not you have a ring on your finger. I think too often we make things that aren’t really that important our focus. Relationships are one of those things we often do that too. 1 Corinthians 7:17 is a verse that I’ve read almost daily for years - when I was single, dating or married. It is a reminder not to put small things (like relationships) in the place where the big things (like living, obeying, loving and believing) should be. 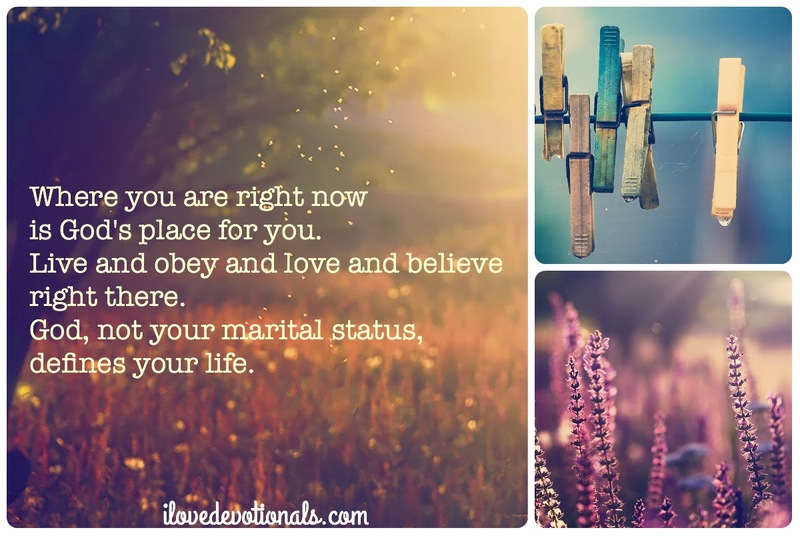 If you allow it to, this verse will remind you, that no matter where you are or who you are with, you are exactly where God wants you and in the best place for him to use you. If you are having a tough day today write this verse down, put it in your pocket and read it every chance you get. Then talk to God and ask him to show you how he would like you to live, obey, love and show your belief in him right now, where you are, with the people around you. I think that what God really wants from us – married, single, divorced or in-between – is to be content with where we are and who we’re with. Single? Married? Divorced? In-between? Who cares! God not your marital status defines your life. Prayer: God, sometimes I wish I was someplace else or with someone else but I’m realising that where I am right now is where you want me. Lord, show me how to live and obey and love and believe right here. 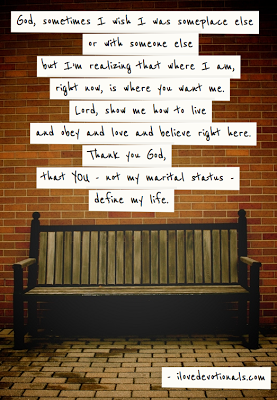 Thank you God, that you - not my marital status - define my life.